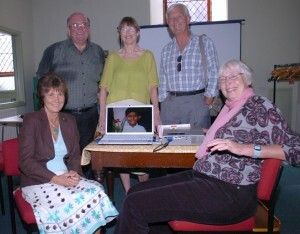 A gathering to celebrate the establishment of Project Sri Lanka charity was held for our local supporters in Berwick-upon-Tweed, Northumberland, on 3rd August 2011. The event was attended by all five Trustees, donors from the Berwick community of Spittal, and contributors to the charity’s ‘sponsor a child’ scheme. Presentations by Trustees explained the origins and development of Project Sri Lanka over the past 6 years to the point of it becoming an independent registered charity, and illustrated their own visits to Sri Lanka and work with communities there. We acknowledge and thank Tweeddale Press for providing this photo of the Trustees at the meeting held in Berwick-upon-Tweed on 3rd August 2011.